Gosh, it's almost time to go out and start grilling. WOW. The 4th is coming up in a couple of days but if you want to get ahead of the game, you can start celebrating on the 1st, which just so happens to be Canada Day. Happy Canada Day to my fellow Canadians. Happy 4th of July to Americans. I'm celebrating both, cause I can. So I don't have many grilling recipes, but I do have ideas on other foods. Including maybe doing a Low Country Boil. Personally I love making one of these up, and it always looks spectacular and depending on your budget, adding a few crab legs in at the end can send this great dish over the top. You might want an appetizer with that meal so how about some of these, my Crazy Squared Deviled Eggs. Or just a nice old fashioned starter or side like this for your lovely grilled steak. Caesar Salad with a dressing you make yourself. You really can make your own dressing. That's but a few ideas, now go forth and grill or boil and have a safe wonderful Canada Day or a Fourth of July celebration. Well, we had adventures yesterday but it all turned out well. There was a power outage, don't know the details, and in the south, when temps are upwards of 90+ degrees outside, air conditioning is a MUST. So when the power went out, we got the generator going, hooked up some fans, borrowed a fan from the neighbor, and welcomed our guests. And we actually had quite a few people come, and they were prepared to sweat it out with us. Luckily, the power came back on, not too long after our guests arrived, and we proceeded to eat and party. There were a couple of late comers who'd had to find a place with power so they could finish making their dishes, and I totally did not get pictures of those. There was also a fruit salad which got missed as well. I thought I would start with the appetizers first. Artichoke Dips, and I got a picture, (blurry) before it disappeared. I made some Rye Bread and served it with some Mackerel in Tomato Sauce with Mayo as well as an Herbed Pork Roast with dipping sauce. Curry, OMG, it was so good. Pasta Salad, you notice the closeup? So good. and this Spicy Watermelon, very refreshing, it was. as well as Dessert. Life just isn't complete without dessert. I have to say, if you go home hungry from here, it's your problem, there's always great food and the company's pretty good as well. It's time for the Fantastical Food Fight - Seafood edition and I had a little fun with this. I decided to make this for our weekly Taco Night, at least for my meal. Since I'm the seafood lover in the family. I had a cantaloupe and played with the idea of using it in a salsa to top the fish. Previously I've made fish taco's with Mango Salsa for Fish Friday Foodies, and I know how good fish is topped with a little fresh fruit. And umm, this Cantaloupe Salsa was so good I was eating it with a spoon, even after topping my fish Taco's with some of the salsa. The jalapeno's I put in did kinda overpower it a touch though. I didn't realize how hot they were. Good thing I like spicy food. Let me tell you about Fantastical Food Fight. Fantastical Food Fight is a group of food bloggers who are challenged to come up with a recipe using either a theme or an ingredient each month. 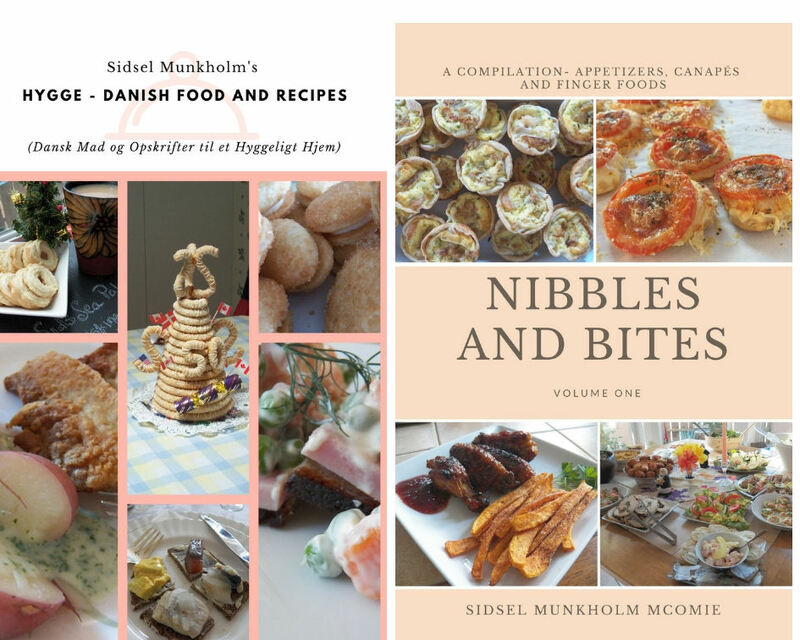 You can make up your own creation, find it in a cookbook, online or on another blog. If you want to know more about it, check it out here. This is a fun take on Fish Tacos'. The Cantaloupe Salsa adds a fresh light touch and it tastes great as well. Dice the cantaloupe, jalapeno, red onion and mix together. Add the cilantro and taste. Mix in the ranch dressing and let set for at least half an hour before using. Cook fish, either by frying or steaming it, with the 1 teaspoon butter and 1 teaspoon lemon juice. Dry fry 1- 2 flour tortillas, just until heated through. Place some of the Shredded Napa Cabbage on top of the flour tortilla's top with 1/2 the cooked fish on each tortilla, then add a spoonful or more of the Cantaloupe Salsa. Fold over and eat or serve right away. Note: you can adjust the amount of jalapeno to suit your taste. The challenge this month for Soup Saturday Swapper's was a Chowder. 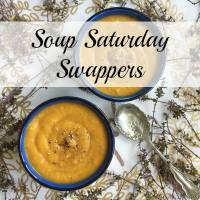 Soup Saturday Swappers is a great group of bloggers who post a soup on the third Saturday of the month.A Day in the Life on the Farm is our hostess this month and also the one behind this madness called Soup Saturday Swappers. You can join in on the fun if you like, just email Wendy and let her know you'd like to join. Each month has a theme and it's always fun to see what we all come up with. But back to Chowder. I looked it up on Wikipedia and found that it's a soup which is prepared with milk or cream and thickened with crackers or a roux. I had lots of carrots, as well as some sweet potatoes in the pantry. I took some chicken stock out of the freezer and cooked the chunked carrots and sweet potatoes in it until they were just done and tender. I took most of the veggies out of the pot, and left about 1/2 cup of cooked carrots and sweet potatoes in the broth. Grabbed my immersion blender ( I love my little immersion blender), and blended the remaining veggies into the broth. This gave me a nice platform. Let it simmer over low heat for about 5 minutes, and added the cooked carrots and sweet potatoes back into it. Swirled a little creme fraiche on top and devoured it. I'm thinking this would be a great fall dish as well. There's very little fat in here, and no added salt, and you could also make it with a vegetarian stock as well. This chowder is hearty and satisfying, and quick to get on the table. Serve for lunch or as a starter for a light dinner. Peel and dice the sweet potatoes and carrots and place into a pot. Add the chicken stock, the candied ginger, thyme and coriander and bring to a boil, reduce heat and simmer until the veggies are cooked. Remove all but 1 cup of the cooked vegetables and set aside while you thicken the stock. Stir in the roux and increase the heat, bring back to a boil, let boil for one minute. Then taking an immersion blender, blend the stock and veggies until the potatoes and carrots have pureed. Add the reserved potatoes and carrots back in, stir to combine and then ladle the chowder out into a bowl. Top with some crème fraiche and maybe the odd piece of parsley and serve. This goes very nicely with some fresh baked bread. I'm the hostess for this month's Fish Friday Foodies and when I suggested a Fish Salad for this month's theme, I had no idea of what I was going to make. I would have loved to share how to make Sildesalat, but I've done that before, and it's a great salad BTW, but not for everyone. You know we Danes love our fish and will use almost any excuse to have it for dinner. This salad works well as such. This salad can be served hot or warm, and it's a slightly different take but perfect for summer. You can use some of those little bitty zucchini as well as some young crook neck squash for it. And if you've never cooked with fennel, this is an easy one to start with. Although don't buy the big fennel bulbs for this, they're a little on the tough side. Please learn from my mistake. And the tomato's you see are just there for decoration, although they did taste good with it. I did modify the original recipe cause, gee, I'm the cook? And the leftover veggies, cause there were some, tasted so good sauteed with a little sesame oil and some sweet soy sauce. Next time I make this, I'm going to use Bok Choy though, I discovered, I really didn't care for the Fennel. Prepare the lemon butter by melting the butter in a saucepan over low heat, add the lemon juice and garlic and cook for a minute or two. Turn off heat and let cool. Cut the squash slices into quarters. Heat the oil in a frying pan over a moderate heat. Fry almonds in 1 tablespoon oil for approx. 2 min. Turn up to high heat and add the fennel, let it cook for about 3-4 minutes and then add the squash, and turn heat down and cover and let cook for about 5 minutes or until the squash is cooked and sprinkle with salt and pepper. Leave to cool for just a moment or two, then arrange the spinach and top with the cooked warm vegetables, and the lemon wedges. While the vegetables cook, prepare and cook the cod. Take some of the lemon butter, and melt in a saucepan. Add some slices of lemon and place the cod on top, sprinkle with a little salt if desired, and place a lid on top and let steam until fish is cooked and flakes easily. Place the cooked fish on top of the vegetables and pour the remaining lemon butter over top. Serve warm with a nice crusty roll on the side. Some of you may remember that I used to post about a Boat Club Potluck that we attended. The food was always fantastic, the company was great and a good time was generally had by most. Well, all good things come to an end and the people hosting the Boat Club Potluck were unable to continue hosting so we had an empty spot on the calendar, the second Monday of the month to be exact. Not any more, we've got a new venue, and the Boat Club Potluck is now known as the Community Potluck and will be held the second Monday of the month at a new location. This past Monday the first Community Potluck was held and a lot of great food was brought and shared. I gotta say this community does love their potlucks. And as a friend of mine says, "I bet you could go to any event here with a covered dish and be welcomed, whether you were invited or not" I actually paraphrased her a little. All that aside, here's a roundup of the dishes that were brought, shared and enjoyed. That's it for this month. Can't wait to see what's brought next month. We'll be doing this every month, the second Monday.